Although this book could be read on its own, do yourself a favor and read Book 1, My Name Is Not Alice, first. You won’t be sorry and it will be a lot easier to understand what’s going on in Book 2. A few weeks after the end of Book 1, Alice Adams is learning to use her magic powers, figuring out her relationship with Trouble Walker, and oh yeah, going back to school and trying to graduate while supernatural events threaten those she cares about. Business as usual for the Resident Witch in Training. Fortunately, she has a team of sidekicks; even those without magical abilities have critical skills for getting the job done (with smarts and wisecracks). The main plot revolves around an unknown antagonist who seems to want Trouble dead. Following a thrilling monster fight, Alice and friends gather enough clues to figure out who, but not why. And why is there another witch in town? The adults in their lives, from parents to members of the magical community to two police detectives, offer what help they can to solve these mysteries, but Alice and Trouble decide they need to go back in time to find the information they need. They end up ensnared in a time conundrum that they can’t undo but fear they’ll make worse. In the midst of all this, Alice is working through issues of the heart: does she love or hate her mother, who never revealed they were both witches and nearly killed Alice in Book 1? What does it mean to love Trouble when she doesn’t have time to be the kind of traditional, devoted girlfriend she thinks she’s supposed to be? And is she still a good person if she chooses to get her hands dirty in the fight against evil? 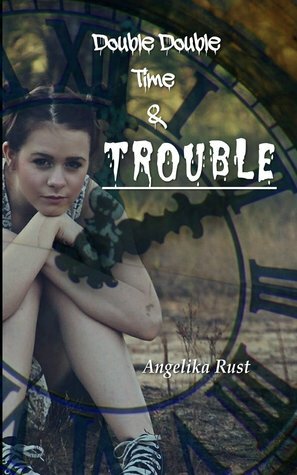 Author Rust has done of fine job of working these deep, thoughtful themes into a satisfying and entertaining magical adventure. She clearly had fun with the convoluted time travel plot. As a reader, I appreciated that the characters were as confused by the conundrum as I was. And then she pulls the rug out by hinting that it was even more complicated than they realized. As in Book 1, this story is a scavenger hunt of song references, but works perfectly well even if you don’t recognize most or any of them. And there seems to be a promise that in a future book, Alice and friends will finally start a band.